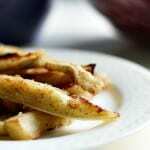 Home » Appetizers » Gluten Free Eggplant Fries. 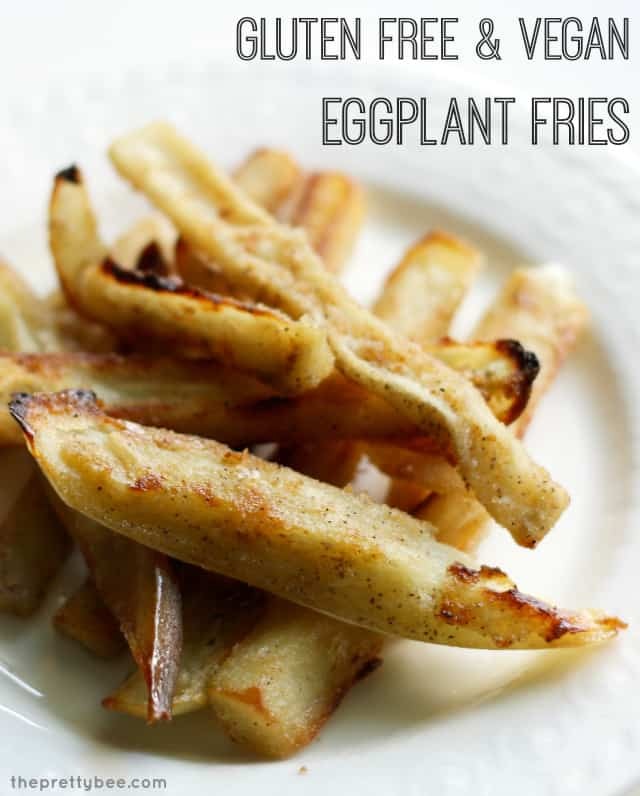 Gluten free eggplant fries are crisp, seasoned, and so tasty! 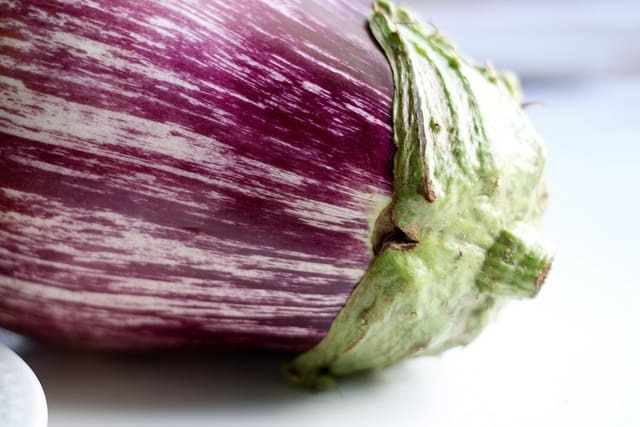 A great way to enjoy eggplant! So we get home and he said, “What do we do with them?” And I looked at him and said, “Um, what? Hahaha, I don’t know, I thought you had something in mind when you bought them!” And he said, “Nooo…but they were so big, and they seemed like a good deal! Let’s fry them!” And I rolled my eyes, because I am not a fan of fried food. But he hopped online and found out that you can make eggplant fries. And we just happened to have an unopened box of this Gluten Free Seasoned Flour (affiliate link) in the pantry, so we decided to try it. And, surprise! These gluten free eggplant fries were delicious. Crispy seasoned eggplant fries made easy! 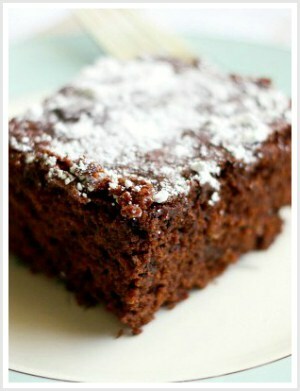 This recipe is gluten free and egg free. 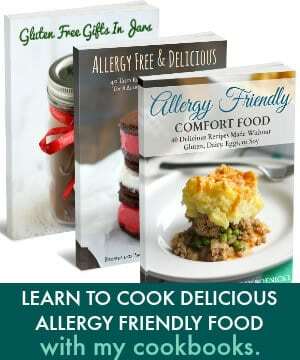 Cuisine Dairy Free, Egg Free, gluten free, vegan. Turn on the broiler. 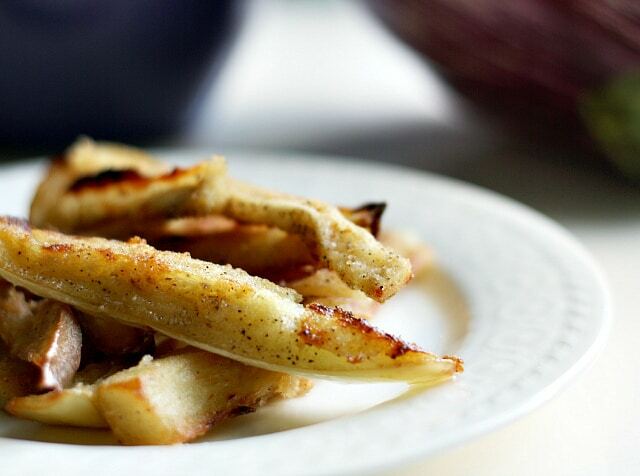 Cut your eggplant into french fry like strips. They need to be kind of thin, the thinner ones got nice and crisp, and the thicker ones were soggier. Put about a cup of the seasoned flour into a ziploc bag, add the eggplant strips and shake! Heat your oil in a large frying pan. We used about a cup of vegetable oil. Once hot, add the coated eggplant strips and fry until golden. Transfer to a paper towel lined plate to drain. Then transfer them to a parchment lined baking sheet and broil in the oven to make them crisp. This should only take a few minutes. Keep a close eye on them, you don’t want them to burn. Once they’re nice and crisp, transfer them to a freshly lined plate to drain again. I am not a fan of eating extra grease, and I found that really draining them thoroughly was important to keep them crispy, and not super oily tasting. I was very surprised by how tasty these were! They were a bit rich, but were delicious! I’ve decided I like them more than I like fried zucchini. 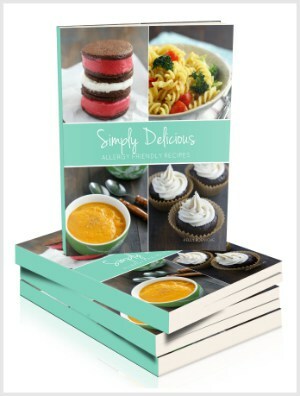 What new recipe have you tried lately? 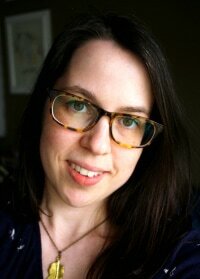 « How to make your own deodorant. Yum! I have a couple of eggplants growing in my backyard right now too!! I really want to grow eggplants next summer! These look and sound delicious!! YUM!